All topics Aviation, Peruvian Horses and more!!!! It’s August 2018. I’m a new ferry pilot and I’m on a commercial flight out of Minneapolis on my way to LA. Once I arrive, I’m going to find my way to Lancaster, California, where a 1977 Cessna 152 is awaiting me. This is my first solo ferry since being brought on as a contract pilot for FullThrottle Aviation LLC. I’m grateful because the staff at FullThrottle Aviation has briefed me and prepared all the documentation to export the airplane on this international ferry. Logistically I am trained and prepared. I have done the homework, have the equipment I need and I am ready… but definitely intimidated. This isn’t just another day of cross country flying. The destination for N714VT is El Salvador. The challenge doesn’t begin when I cross the Mexican border. It begins when I depart Lancaster into high density altitude and limited performance of the 152s Lycoming O-235-L2C which comes in at 110 horsepower. I land at LAX, take a two-hour shuttle to Lancaster, meet the seller, meet the plane. The second the shuttle door opens and I step down, I take a halted breath. 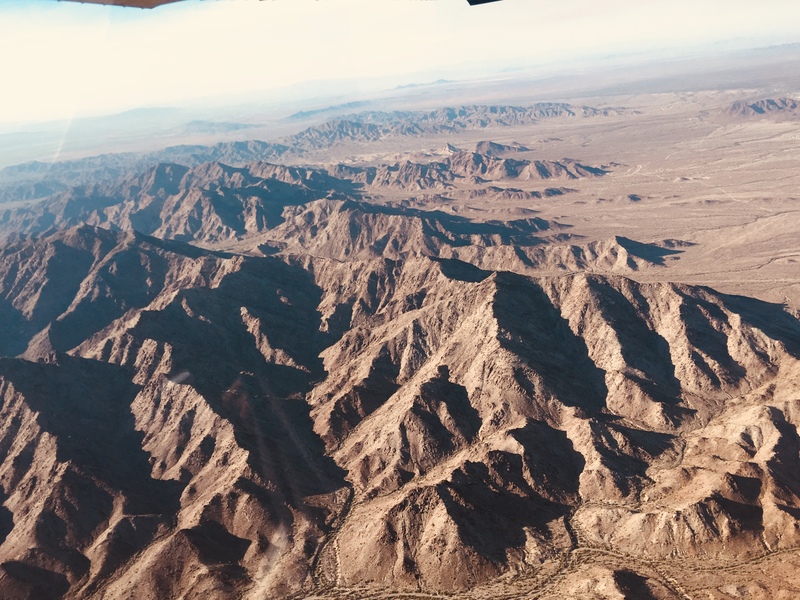 The dry 108-degree heat of the Mojave Desert engulfs my lungs and I am shocked with the realization that this is going to be the hardest flying I have ever done. The wind is gusting at 25 knots. I check my phone quickly and am relieved that it is nearly coming straight down the runway. In the car with the seller of the 152 and his 2-year-old daughter, the airport comes into view. Why are there a whole bunch of semi-trucks and a huge crowd of people? The seller tells me that Matt Damon, George Lucas and cast are here filming a movie about Ford motors. “Great…” I think, “first ferry, obnoxious wind, new airplane, high density altitude, movie star audience… seriously.” I check out the airplane and read through the logbooks. This is a very clean C152. The seller brings me to a Walmart so I can buy supplies. Four gallons of water, beef jerky, cans of fruit cocktail in juice, electrolytes, KIND bars, nuts, a funnel, roll of paper towels, a couple carabiners and a fresh salad for lunch. Back at the airport, I load up the airplane. It’s time to go. I have aeronautical charts up on my iPad, radio frequencies, route ready. I call tower and receive taxi instructions. I’m careful to implement crosswind correction. Run up. The right magneto drops more than it should. I check for fouling, lean, add power, let it run, back it off, check it again. This time it’s perfect. “Ok Aura, it’s now or never,” I think. The heat is sweltering. I have already sweat through all of my clothes and the sun is beating on me through the dual sunroofs. Depart, left turn to head Southeast. I am holding in climb at 67 knots just like the POH said and I am climbing at 200 fpm. You have got to be kidding me. This haze or smoke is making the visibility limited and I am not going to get above those 5,500-foot peaks in time. Switch to Joshua Approach. I glance down at my iPad to see the chart and exactly how much I need to climb to clear those peaks. Nothing. Black, shut down iPad. It overheated. You have GOT to be kidding me. I grab my phone and quickly pull up Foreflight. Plan bravo. Turn Northeast where it’s flat and keep climbing until I have enough altitude, then head on course. In the meantime, I shove my iPad into my ferry bag where there are two cold water bottles. The views are spectacular. The sun is setting behind me and it casts shadows in the mountains. I finally feel at peace. I arrive to Nogales, Arizona after dark. The taxi comes to get me and brings me to the hotel I had booked an hour before from my phone in the sky. This has been a long day. I left my house for the airport at 4:30 a.m. Now it is 9:30 p.m. in an earlier time zone. I need to check in with my family, flight plan for tomorrow and file eAPIS, for the first time ever. I have a date with customs at Nogales International Airport at 8 a.m. I should probably eat that salad I meant to consume seven hours ago. I’m lined up on runway 21 ready for departure at Nogales International Airport in Arizona. I filed eAPIS last night so border control knows that I’ll be crossing the U.S/Mexico border approximately five minutes from this moment. Ugh. Am I ready for this? 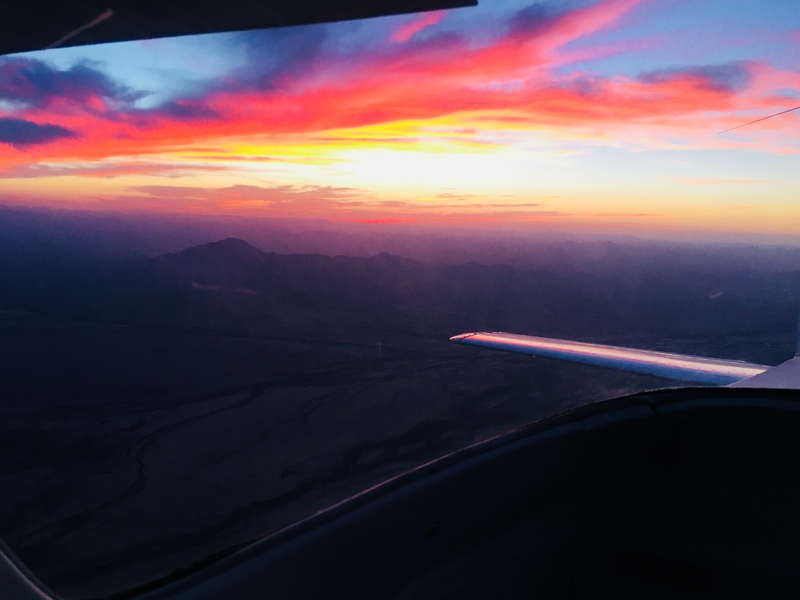 The flying is no problem, I have everything I need and FullThrottle Aviation completed the importation documents and scheduled the handlers, so I even have the names and phone numbers of the people with whom I’ll be working. What intimidates me are those unknown factors after leaving the airport for my hotel each night, traveling Mexico alone. 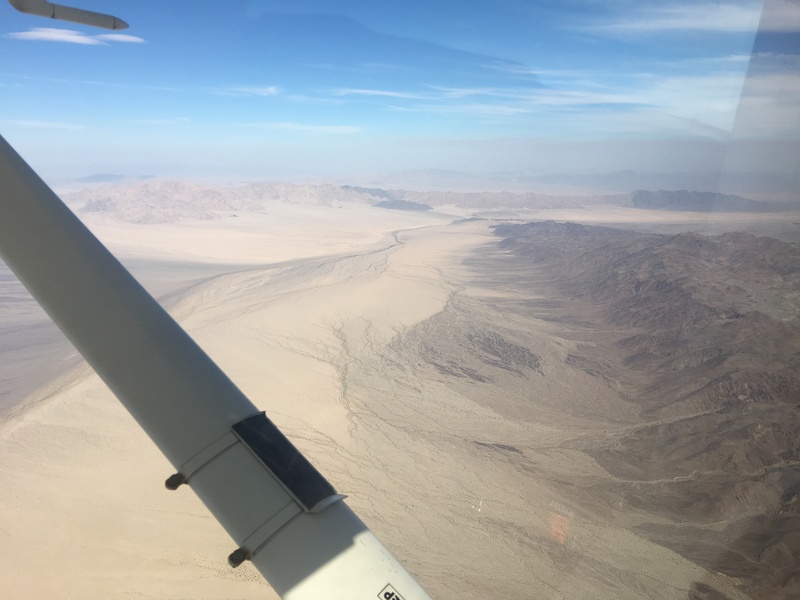 Surely navigating Mexico on the ground can’t be any more difficult than flying this Cessna 152 around restricted airspace and MOAs in the Mojave Desert in 108-degree heat with a max 200 fpm climb performance, landing to refuel in near max crosswind component. Surely not. I don’t forget that I speak Spanish and have spent more than three and a half months living in the country throughout my life. The plan for this ferry is to start in California, fly through the Mojave Desert to Arizona, all the way through Mexico, over Guatemala and delivery in El Salvador. This one takes guts. I can do it. I’m prepared, a good pilot, I have guts and I speak Spanish. Checklist complete. Full throttle. Mexico, here I come. The view is green, lush and full of life and mountains. I make two full turns to spiral up and gain altitude before crossing the Mexican border and to clear the peaks ahead. I switch radio frequencies, leave the chatter behind and I’m left in silence to appreciate and speculate what awaits me at customs to import the C152 at Hermosillo. I’m starting to get used to how she feels, what I can expect and what is normal. Every 10 minutes I document oil temperature and pressure, amps, power, fuel burn. She’s running perfectly. Customs advances without a hitch and one and a half hours later, I’m off. I land at Los Mochis and once again learn that everything in Mexico is in its own time. Fueling, paperwork, payment, I can expect to be on the ground one hour each time I land for fuel. That changes how I need to plan each day. We have it so easy in the States. Seldom a landing fee, fuel yourself, pay at the pump. Here in Mexico I am at the whim of the airport. First, dispatch or dispacho, to obtain a Plan de Vuelo, flight plan. I need help filling it out the first time because it’s new to me. Then to Comandancia where I prove my right to be in the country and that I have Mexican insurance. Each copy gets stamped. Then I bring the Plan de Vuelo to Operations to pay the landing fee and obtain yet another stamp. After going to the third office, I head back to dispatch with the stamped Plan de Vuelo, proof of payment and wait while they enter the information into the computer. One hour, fuel truck, three offices, a bathroom and I’m (finally) ready to get back into the sky. The final stop tonight is Mazatlán. 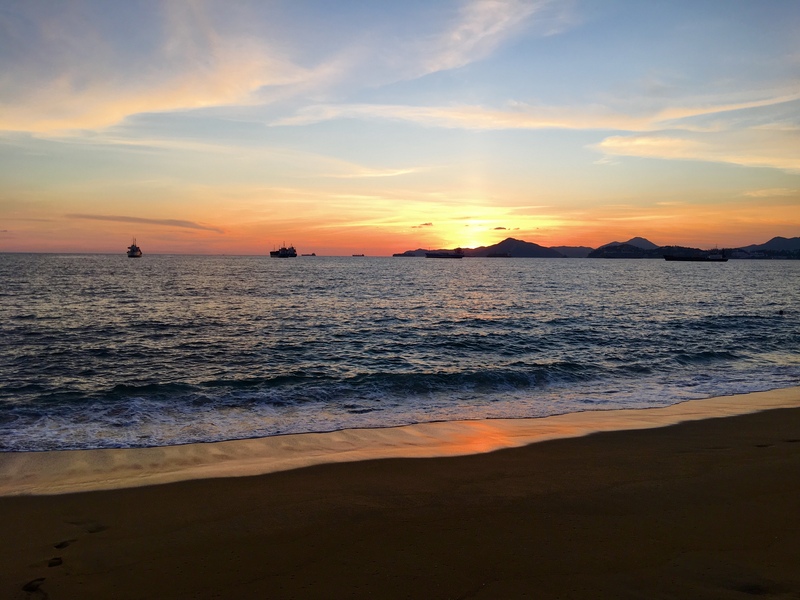 Even when I lived in Mexico for three months, 15 years ago, I had never been to Mazatlán. I am in for a treat and beauty unlike I have ever seen from the sky, this whole trip. The weather is overcast and rainy this morning. I read that in the C152 after rain it’s very important to lower the tail, rock the wings and sump any accumulated water from the fuel. I am to repeat this procedure until there is no more water in the fuel tanks. I’ve never had a routine quite like that but I will follow instructions like my life depends on it, because it does. Every moment on this journey, I am learning. For example, traveling in Mexico alone isn’t dangerous if I’m smart, diligent and kind. Weather planning is a beast that’s becoming my friend. Even with international data on my phone I’m having a hard time loading the websites that will tell me weather forecasting and therefore how far I can make it today. What is deceiving is that bad weather can be so close to my flight path with the Sierra Madre Mountains running adjacent to the coast. Pleasantly for me, on the coastline it’s blue skies and sunny. I’ve learned that webcams are really helpful. Every airport is a towered international airport. I used to get conscious about that sort of thing and now it’s a welcome voice amongst beautiful scenery. I land in Puerto Vallarta. When I park and begin to walk to the GA terminal building next to the big international terminal, I turn around to look at the plane. She’s so cute. Behind her taxis in a huge jet. I snap a picture. In this moment I realize that I haven’t seen another GA airplane in the sky and very few at the airports. This little bird is the smallest in the sky. She’s definitely not cut out for hard labor. For the first time ever, I name a plane. Tweety. Tweety and I continue onto Manzanillo. 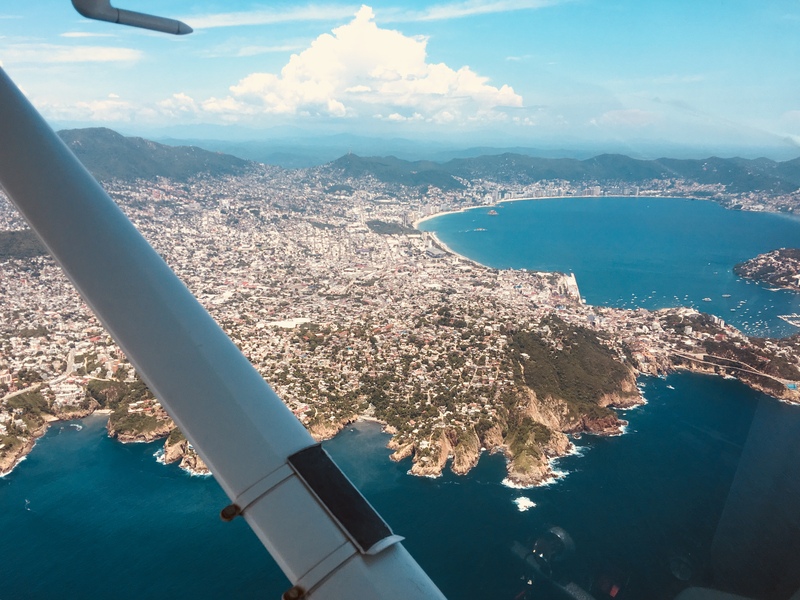 As if it wasn’t magnificent enough to be flying down the Pacific coast of Mexico, the airport at Manzanillo is called Playa del Oro or Beach of Gold. I’m looking at my chart so I can start trying to identify where to spot the airport. 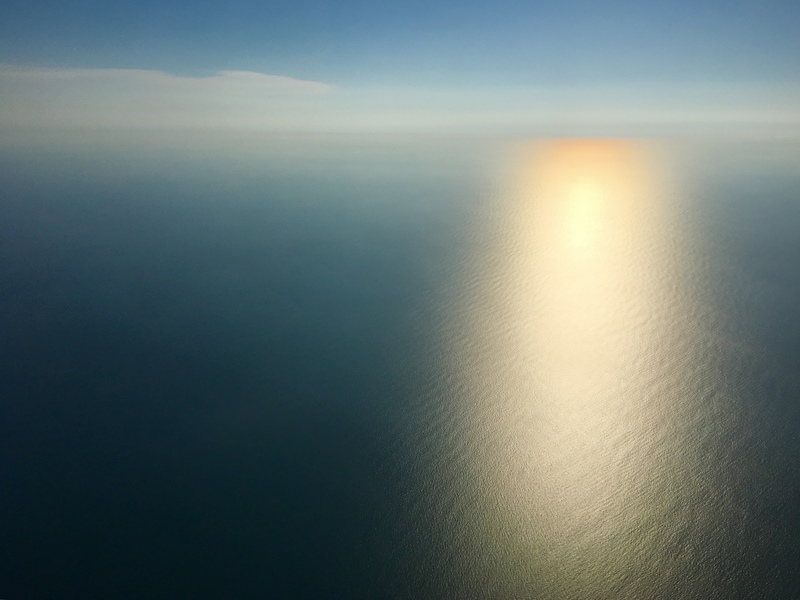 It seems that it’s in the ocean. I enlarge the chart and look again. It has to be directly on the beach. I look for it again. I think I make out the tower. This is going to be unlike anything I have ever seen! It is. 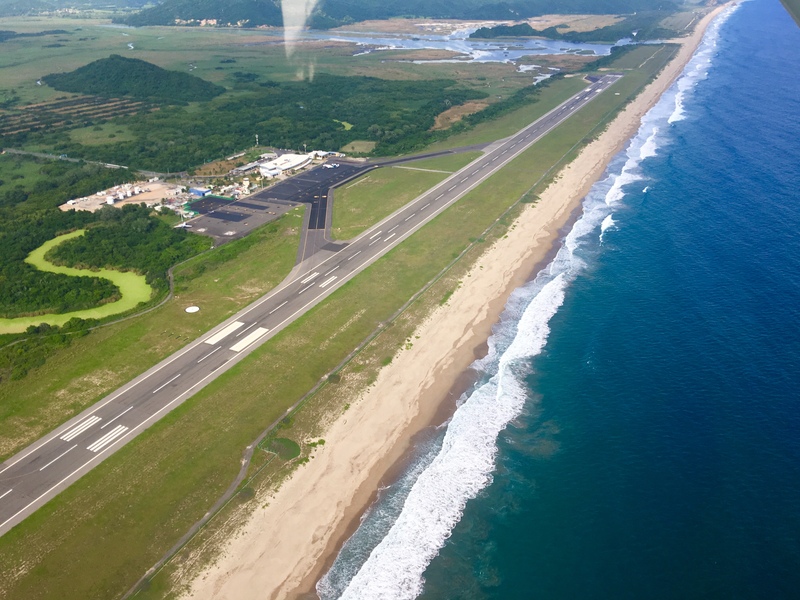 The runway follows the beach and is right off the sand. This view I will always remember; blue sky, turquoise water, Sierra Madres. It is magic here. Magic. Limited daylight prevents me from taking another 3-hour leg, so it’s a short flying day and an early night. The airport is 45 minutes from town! When I arrive at my room, I look out the window at the beach and the setting sun teasing the horizon. I realize I have a rare opportunity as a ferry pilot; to enjoy my surroundings. I throw on my bathing suit which I only brought along because this route is down the whole coast of Mexico, and I head down to the beach. The water is warm. The colors in the sky, tantalizing. I swim out from shore then swim back and forth. The swells make my body rise and fall as I swim. The beauty is beyond words. This is the perfect ending to any day. Gratitude is what I feel. I have been safe. Tweety is performing well and predictably. I have a supportive husband, daughters and family all cheering me on and tracking my path on the GPS device I carry. I became a pilot because it was my dream. Now I am starring out at the most beautiful sunset I have seen in my 35 years, my feet dug into the still-warm sand, knowing that I got myself here. No one else. Me. I feel strong. Tomorrow will be long and I am ready. Waking up before the sun is awful. At this moment I feel like it might be against human capability to naturally awaken before dawn. Despite my protesting body I know that I have a tight schedule today. If I leave exactly when I plan and take one hour at each stop, I will land in Bahias Hautulco 20 minutes before the airport closes. If the wind picks up then I am going to have to change the plan. Moving Southeast down the coast I ALWAYS have a headwind. Tweety only carries 24.5 gallons of fuel so our range is limited. As it stands I need to get into uniform and get down to breakfast. One part that I love about Mexico is every restaurant serves fresh cut fruit. I can live on fruit. Along with my omelet I ask for the fruit platter “para llevar”, to-go. I know already that the fruit will feed me all day long because today doesn’t afford a lunch break but there is 8 hours of time to eat in the plane. I also have the other non-perishables but this fruit is going to be my gem today. The schedule, Zihuantanejo, Acapulco and Bahias Huatulco. Acapulco is spectacular. Huge population, bright buildings and orange clay roof tiles. The shape of the land is in bays and coves, every part of which is populated. The international airport is nice! Each airport has an international side and general aviation area, for Tweety and I. I wish I could stay here. It’s a beautiful day that makes the turquoise waters even more pronounced. Acapulco will be my fastest stop at 30 minutes which is a welcome schedule adjustment because headwinds have set me back 20 minutes. When I’m in the sky it’s serene, peaceful and beautiful. Once I am done talking with tower and departure, I turn on music by Bluetooth to my Bose headset. I watch the sky, scan for traffic, am constantly glancing and evaluating the instruments and performance of the airplane. I’m in the present moment. I started flying one year and nine months ago. 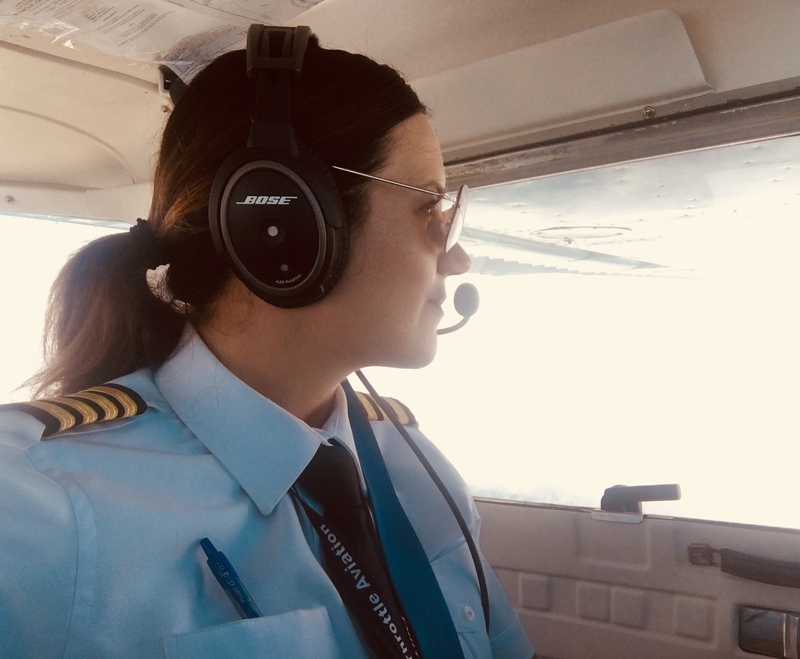 Now I am a single and multi-engine commercial instrument pilot and CFI who is flying down the coast of Mexico. Flying has been a dream of mine for 20 years. I lost sight of it because I had no idea I could have a family and be a pilot. It was never on my radar. 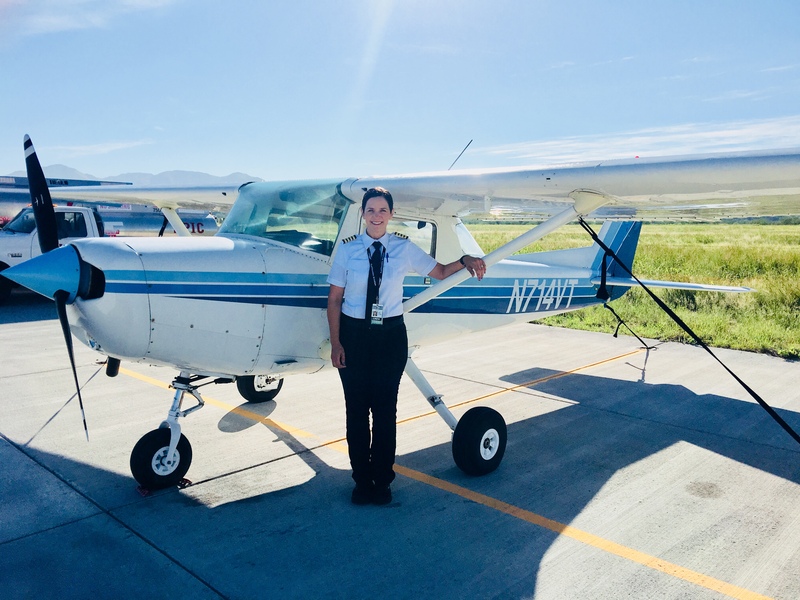 I thought I would be able to be a private pilot but never dreamt that I could make a living doing what I love which is what I would do on my time off. I look to my left at the storm clouds building next to me over the Sierra Madres and I’m not worried because they won’t join me on the coastline. Midway between Acapulco and Bahias Huatulco the topography is starting to change again. Oil pressure, oil temperature, vacuum pump, alternator, RPMs, fuel burn; all are exactly as I expect them to be. That’s one thing I’ve become accustomed to as a ferry pilot, to constantly monitor and document the instruments, figure out what is normal for an airplane and innately know when something moves outside normal. Secondly, the plan will change. Not that it might, but it will, at some point on every ferry, change. I’ve come to expect and welcome it as another norm of the trade. This attitude has taken out the concern when the plan changes. Now I quickly adapt and move forward with the new plan, that also might need to change. I hope approach sends me over to tower soon because I’m 45 nm out of Huatulco and the airport is supposed to close 5 minutes before I get there. My fruit is long consumed. I am hungry, tired and almost 8 flight hours in today. I’m in luck, approach sends me over to tower. I’m cleared to land and I relax knowing I won’t be rejected when there is nowhere else to go and not enough fuel to get there even if there was. Land, taxi, unload, tie down. I go call for a taxi and head to the hotel. Tonight, I need a proper meal and maybe a margarita. Yes, definitely a margarita. The air in the outdoor restaurant is crisp yet warm. I am being serenaded by a three-man mariachi band with gorgeous voices. At this moment, I couldn’t’ feel more relaxed. The fish is delicious. I’ve called home and talked to Chris and the girls. I am back to work at the restaurant table flight planning for tomorrow. There are two legs left before delivery. This is the most challenging planning thus far. 279 nm, the max range with reserve. If the winds change, there goes the reserve. NOT a situation I am willing to experiment with. I will need to be sure before I depart. There are no airports in between to land and fuel. I have calculated as much as I can tonight. I should land in Tapachula with a 45-minute fuel reserve. I am satisfied but will wait to make the call until morning when I load fuel and calculate exactly how much I burned per hour today with similar wind and altitude I expect for tomorrow. We shall see. Today is delivery day. First a 3-hour leg to Tapachula. Despite that my calculations show I should land with a 45-minute reserve, I am not comfortable so I take care to fly perfectly. Perfect heading, perfect altitude, no deviation. Deviations use fuel, fuel is precious to me. In Tapachula I am greeted with more than the usual company. This time I have export customs and the Mexican military greet me. I don’t mind. A young man, probably no older than 20, arrives to check the airplane with his dog. I am eager to load fuel then convert liters to gallons and see how I did. I landed with a one-hour fuel reserve!!! I am SO pleased! I unload all of my belongings and go inside to complete the paperwork. There was a handler waiting for me with my documents that were sent ahead of me, so aside from paying dearly for the service, this stop is going to be quick. I check the weather for San Salvador, a couple of airports in between then I look at the big picture. The weather is deteriorating but I feel there will be an opening for me. It’s time to go. It seems officials aren’t nearly as worried about letting me leave their country than they were when they accepted me. Whatever the reason, I am pleased to depart, fly over Guatemala and take to the last leg into El Salvador. After departure it takes 20 minutes to climb. Tweety is doing her best at 300 fpm. There are scattered cumulous clouds everywhere and I’m losing some of my vertical lift every time I maneuver around them. This isn’t going to work. What was initially an hour and a half reserve is going to be zero if I have to dance around these clouds the whole way there. There has got to be another way, “Aura think!”, I coax myself. The coast!!! Of Course! The coastline is 15 nm West. If I get over there, despite losing some time, I bet I’ll have a clear shot. It pays off, I have clear blue skies! El Salvador, here we come! I’m watching scattered weather build near where I am going. I don’t have onboard weather so I have to use what I’ve learned to interpret the weather myself. It’s time to move inland again. I fight with and fly around the puffy white clouds which cause the turbulence that I will undoubtedly have for the duration of my journey. It’s tight. I can’t climb because of the ceilings but I don’t dare descend because 10 nm ahead of me is a stand-alone mountain that will only be 2,000 feet below me when I cross it into San Salvador. THAT is close enough! I also know that Tweety doesn’t do hard labor. In this density altitude I could expect no more than 200 fpm climb rate which wouldn’t help at all if I descended too low. I begin to see San Salvador below me and in windows between the through the clouds. After this last mountain, I’ll be able to begin a steep descent to prepare for a right base into Ilopango. 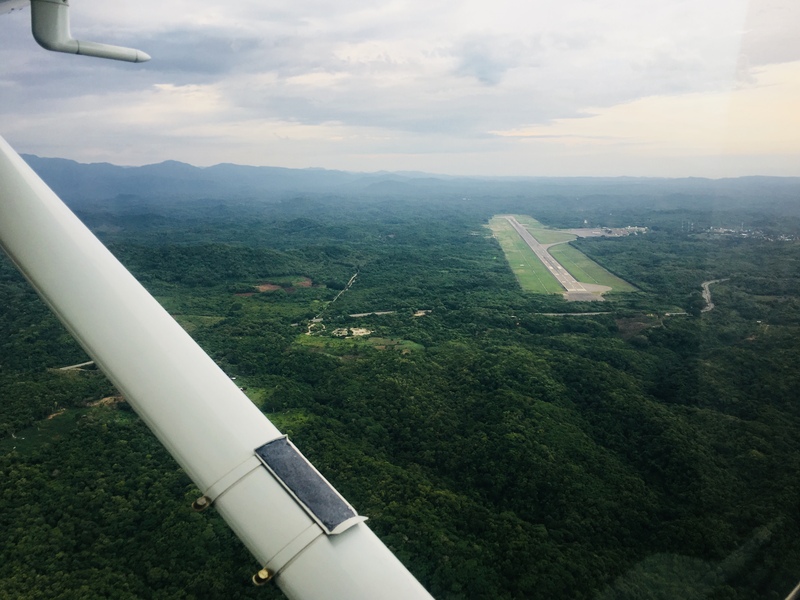 In alignment with the past four days, the approach into Ilopango doesn’t disappoint. It’s beautiful and green adjacent to a huge lake. Upon landing, I taxi to where ground control directs me. As soon as I make the turn on taxiway Alpha, I know. Gabriela and her grandfather, the man who started the flight school many years ago, are smiling, cameras up, waiting for me. I give an enthusiastic wave and smile. Park. Checklist. Shutdown. Headphones off. I’m here. Gabriela and her grandfather are a central American welcome with bright smiles, a firm handshake and a kiss on the cheek. They laugh at the ingenuity of the taped sectional charts over the two big sunroofs that protect me from the sun during my 5-day journey. I go inside to clear customs which was simple and quick. I receive another stamp in my passport, pay the $2.30 USD to close my flight plan and its time to do one last favor. Since Tweety is a “November” plane registered in America, none of their pilots can fly or taxi it until its reregistered. One flight student got to come along to sit my right seat and show me where to taxi Tweety. It wouldn’t have been hard to identify on my own because when I rounded the bend of the taxiway Alpha at Ilopango, there was a huge welcome party. All the flight students in their uniforms with various amounts of stripes, waiting for Tweety. Among the crowd I recognize Gabriela and her grandfather, all smiling, all overjoyed. Tweety will be readily repainted and reregistered to match the fleet. She’s a good bird. Maybe not as strong as some of the others I fly but she is steady and predictable. I wonder how many pilots she will train. Maybe hundreds before she retires. I feel pride in myself that I have a hand in the bright future of the aviation world. I had the heart to get her here. Loved reading your report and seeing the beautiful pictures!!! Great story and great flight. You wrote it so well I was with you every nautical mile of the way. Sorry not to meet you here in Mankato. I hope to some day. Keira on WHY not now?